Summary Multi AP system using Wi-Fi mesh. Updated 8/2/16 - Wireless retest done. Luma is the second "mesh" Wi-Fi product to become available, trailing first-to-market competitor eero that started shipping in March. These systems basically use multiple access points (APs) to provide more consistent and higher bandwidth Wi-Fi over a larger area than a single wireless router can. At least that's what they are intended to do. To keep installation simple, "mesh" Wi-Fi uses wireless connections among the modules spread throughout your home. And there's the rub. The "backhaul" connections between APs compete for the same bandwidth as the devices you're trying to get good Wi-Fi to. And for cost reasons, these products don't use dedicated radios to get packets from your devices, then AP-to-AP and finally to the single unit connected via Ethernet cable to your existing router or modem. How well all these connections are managed is each manufacturer's "secret sauce" that is still being cooked up, using your home as the test kitchen. Since many of you are trying to decide whether to try Luma or eero (or whether you should give Luma a shot after eero has disappointed), I'll be making frequent comparisons between them as we go along. Luma and eero took different approaches for physical design; Luma is a hexagon that stands upright while eero is a rounded square that lies down. The photo shows their relative sizes, which are pretty similar. Luma's official size is 4.6" W x 4.13" H x 1.18" D; eero's is 4.75" W x 4.75" H x 1.34" D.
Luma's big ol' light ring lights up only during setup or when something is wrong. So it won't serve as a nightlight or bother your spouse with unwanted decoration. But you can't tell at a glance whether the thing is on, either. The rear panel has a reset pinhole, power port, two Gigabit Ethernet ports and a USB 2.0 port that serves no purpose right now; just like eero. Luma's Ethernet ports are purpose-specific; the IN gets connected to your modem, while the OUT would connect to a device or switch if you have more then one Ethernet device to connect. eero automatically figures out what to do with each of its ports depending on what it senses is connected. Like eero, Luma wants you to buy the three-pack that comes with three power supplies, but only one Ethernet cable. This will run you only $399 vs. eero's $499. Both companies also sell single units; Luma for $149 and eero for $199. Since Luma is still busy fulfilling pre-orders until August 26 according to this this blog post, you can't buy it and expect delivery before then. Don't go looking for Luma in Best Buy yet either, because all available stock is going to filling preorders. I should note I purchased my Luma three-pack (as I did with eero) last November to ensure I'd get product to review sooner vs. later. 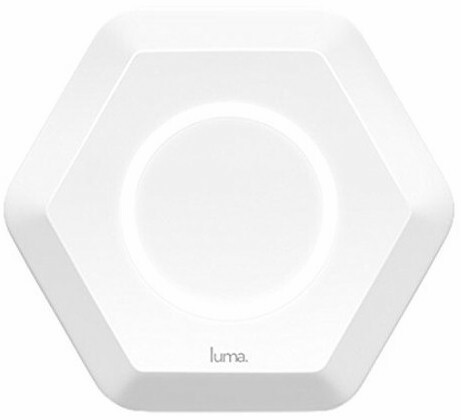 Luma's hardware design is simpler and has fewer radio connection options than eero's. Luma's FCC docs indicate it is manufactured by Taiwan ODM Gemtek, which has requested short-term non-disclosure for the internal photos. So I opened up an unused Luma for a look-see. The design is a straightforward 2x2 AC1200 class router, with two internal dual 2.4 GHz printed circuit antennas positioned on the upper left and right hexagon panels and two 5 GHz printed circuit antennas on the other side of the board on the lower left and right hexagon panels. A single antenna for the Bluetooth 4.0 LE radio sits on the bottom panel. The RF front-ends and RAM are in RF cans; the flash memory, processor / radio SoC and Ethernet switch are not. The latter two components are physically coupled to a heatsink plate by the two thermal pads shown in the photo below. The next shot shows the RF cans removed, but you can't make out most part numbers. The 5 GHz radio connections are at the top of the photo and connect to the antennas on the other side of the board via black cables. The 2.4 GHz connections are right below the 5 GHz and connect to their antennas via grey cables. In contrast, eero has a tri-radio design with one 2.4 GHz and separate 5 GHz low and high-band radios. This gives is more flexibility to manage device and backhaul connections than Luma. The component summary below shows the key components of both Luma and eero. Luma appears to have a cost advantage over eero, perhaps why it has been more aggressive in lowering its price. Luma, however, probably spent more than it should have for its light ring. Two cables plus a separate board with multiple components costs more than eero's single on-board LED. Not money well spent, IMO.